In many cases issues can be resolved by performing one or all of the below tasks. Open the CCleaner Network Management Service Configuration tool and click "Restart". 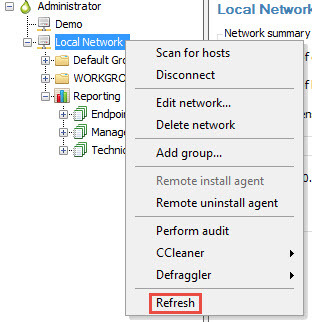 To refresh the network, right-click on your network from the network tree and click "Refresh". Receiving an incorrect "Host Limit Reached" error? 1. From the CCleaner Network console menu, select 'Network > Registration'. This will open the license information window. 2. Click on 'Change key' and paste your registration key - please ensure there are no leading or trailing spaces when you do this. 3. Click 'OK'. This will refresh the registration.